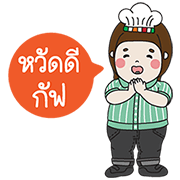 http://www.line-stickers.com/ – Nong Sevy Line Sticker | Say hello to your friendly neighbor”Nong-Sevy”. Day or night, you can always count on him to have something cool to say. Friend CP ALL’s official account to get them. Available till July 22, 2015.